TANAGHRISSON (Deanaghrison, Johonerissa, Tanacharison, Tanahisson, Thanayieson, and, as a title, the Half King), a Seneca, a leading person among the Iroquois settled on the upper Ohio River from about 1748; d. 4 Oct. 1754 at Harris’s Ferry (Harrisburg, Pa.). Little is known of Tanaghrisson’s early life. Gaspard-Joseph Chaussegros* de Léry wrote that he was a Flathead (Catawba) by birth, but had been captured young and adopted by the Senecas; Philippe-Thomas Chabert de Joncaire reported that he came from the Lac des Deux-Montagnes and that “he was formerly inclined to the French, but at present he is more than English.” His special importance lies in the role he played in events leading to the outbreak of Anglo-French hostility in 1754. The thrust of English traders like George Croghan into the country between the upper Ohio River and the Great Lakes about 1745 occasioned a realignment of some Indian groups in that area. Following the defection from the French alliance of the Huron chief Orontony, segments of his tribe and of the Miamis moved from the borders of the lakes to the branches of the Ohio. Tanaghrisson makes his first documented appearance (as Tanareeco) as one of six signers of a 1747 letter, in Croghan’s handwriting, reporting a treaty between the pro-British Mingos and Shawnees and the “Inomey Nation” (Miamis). One of the other “Mingo” signers was an Oneida, Scarroyady, who handled relations between the Iroquois and the Shawnees and was Tanaghrisson’s closest associate. The Iroquois council at Onondaga (near Syracuse, N.Y.) regarded its Ohio settlers, the Mingos, as warriors with no authority to hold formal councils; they had no recognized council fire and no designated speaker (or “king,” in then current usage). However, Pennsylvania’s and Virginia’s interest in trade and, in Virginia’s case, in obtaining land for settlement, encouraged direct dealings with the Ohio Indians rather than with the Onondaga council. In April 1748 Croghan delivered on behalf of Pennsylvania a present of goods to the Ohio Indians, and in September the Indian agent Johann Conrad Weiser delivered a larger present to which Virginia also contributed. The latter occasion seems to have established Logstown (Ambridge, Pa.) as a council place, and at this same meeting Tanaghrisson is identified as “the half King,” a title obviously of English origin (the French equivalent le demiroi appears only in translations) and presumably defining his role as that of spokesman for the Iroquois colonists on the Ohio. At this meeting Tanaghrisson and his associates, as “new beginners” in council matters, requested a supply of wampum which was one of the essential evidences of the validity of an Indian treaty. Tanaghrisson was the spokesman at a conference held at Logstown by Croghan in May 1751, and at another in June 1752, when Virginia sought ratification of a land cession. French military occupation of the upper Ohio, beginning in 1753, brought Tanaghrisson’s career to a troubled climax. Persuaded that British friendship and protection assured the greatest benefits to the Ohio Indians, he sought to unite the tribes in opposition to the French presence. Not all of them agreed with him, however, and his support dwindled in the face of determined French action. The Indians made three formal protests: a rather mild one by the Delawares, one by Scarroyady in the name of the Shawnees, and, finally, one by Tanaghrisson himself, whose demand on 3 September that the French withdraw was rejected by the French commander, Paul Marin de La Malgue. Simultaneously with Tanaghrisson’s errand, Scarroyady headed a delegation of Iroquois, Delawares, Shawnees, Hurons, and Miamis to Winchester, in response to a Virginian invitation, and then to Carlisle, Pennsylvania, to seek support. At these meetings both Tanaghrisson and Scarroyady insisted that they were acting not for the Iroquois council but for the warriors on the Ohio. Tanaghrisson advised the English traders to leave the Ohio. 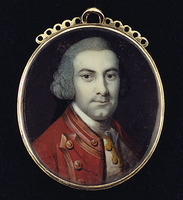 Emboldened perhaps by Marin’s death, however, he and two other chiefs (Jeskakake and Kaghswaghtaniunt) accompanied Major George Washington on his trip to Fort de la Rivière au Boeuf (Waterford, Pa.) with a Virginia demand that the French depart. Rebuffed again, Tanaghrisson returned to Logstown on 15 Jan. 1754, escorted by a French detachment under Michel Maray de La Chauvignerie which set up a temporary post nearby. In the following month Tanaghrisson joined some Virginians in erecting a fort at the site of Pittsburgh, Pa., and aided them until they surrendered on 18 April to Claude-Pierre Pécaudy* de Contrecœur, who proceeded to build Fort Duquesne there. A Virginia detachment under Washington was dispatched to reassert English authority in the region. On the way the troops were joined by Tanaghrisson, and on 28 May he took part with them in an attack on a party of French near the present Jumonville, Pa. The leader of the French, Joseph Coulon de Villiers de Jumonville, was killed, reputedly by Tanaghrisson himself. Washington withdrew a few miles to the Great Meadows (near Farmington, Pa.) and hastily built Fort Necessity in anticipation of French retaliation. On 1 June Tanaghrisson and some 80 to 100 Mingos joined him, but left before he surrendered on 4 July to a French siege. The Indians made their way first to the site of Cumberland, Md., and then to Aughwick (Shirleysburg, Pa.) where Croghan had his trading post. After summoning Delaware and Shawnee leaders to this place for a conference, Tanaghrisson himself went on to John Harris’ post from which he accompanied Conrad Weiser back to Aughwick for a council, 4–6 September, aimed at securing the Delawares and Shawnees in the English interest. The attempt failed: these Indians could not leave the Ohio, and Pennsylvania could not protect them there. Most of the refugee Iroquois remained at Aughwick. About the end of the month, however, Scarroyady brought the Half King and his family, in poor health, to Harris’, where Tanaghrisson died on 4 October. Virginia and Pennsylvania promptly recognized Scarroyady as the new Half King but his journeys to New York to seek help from Sir William Johnson*, the superintendent of northern Indians, left the actual leadership of the group unsettled and, as late as January 1756, a matter of dispute. The fact that Tanaghrisson and Scarroyady were both in turn referred to as the Half King is helpful in defining the sense of this title; but it has occasioned repeated confusion of Tanaghrisson with his associate and successor (who died at Lancaster, Pennsylvania, in June 1757). Not much is known of Tanaghrisson’s family. “Gahickdodon the half King’s Son” attended treaty negotiations at Carlisle in January 1756. Two daughters, one of them the Indian wife of a trader, John Owen, remained for a time at Aughwick, where Fort Shirley had been built, but they left in July 1756 with a soldier from the garrison. A daughter-in-law, identified as Nancy, was living on the upper Susquehanna River in this same year. ASQ, Fonds Verreau, 5, no.60, liasse A (papiers Marin). [G.-J. Chaussegros de Léry], “Journal de Joseph-Gaspard Chaussegros de Léry, lieutenant des troupes, 1754–1755,” APQ Rapport, 1927–28, 355–429. [Christopher Gist], Christopher Gist’s journals . . . , ed. W. M. Darlington (Pittsburgh, Pa., 1893), 80–87. The diaries of George Washington, 1748–1799, ed. J. C. Fitzpatrick (4v., Boston, New York, 1925), I. History of Colonel Henry Bouquet and the western frontiers of Pennsylvania, 1747–1764, ed. M. C. Darlington (n.p., 1920), 41–47. The history of an expedition against Fort Du Quesne in 1755, under Major-General Edward Braddock . . . , ed. Winthrop Sargent (Philadelphia, 1855), 378. Papiers Contrecoeur (Grenier). Pennsylvania, Colonial records, V–VII. Pennsylvania archives, 1st ser., I–II. “The treaty of Logg’s Town, 1752,” Virginia Magazine of History and Biography (Richmond), XIII (1905–6), 143–74. The writings of George Washington from the original manuscript sources, 1745–1799, ed. J. C. Fitzpatrick (39v., Washington, [1931–44]), I, 40–80. William A. Hunter, “TANAGHRISSON,” in Dictionary of Canadian Biography, vol. 3, University of Toronto/Université Laval, 2003–, accessed April 24, 2019, http://www.biographi.ca/en/bio/tanaghrisson_3E.html.